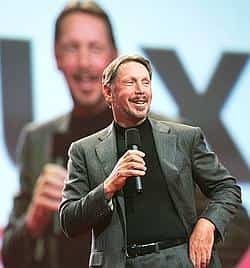 Chief executive officer Larry Ellison of Oracle Corp., who owns $27 billion (Rs 1.07 trillion) of his software company’s stock, recently accepted $53 million in total pay for the fiscal year ended 31 May. And for good measure, shareholders even paid the $1.7 million annual cost of guards and other security measures at his various homes. Is Ellison being shameless when it comes to his pay, or did he deserve it? In Oracle’s proxy filed on 14 September, here’s the breakdown for Ellison’s compensation: a base salary of $1 million; an annual bonus of $8.4 million; an option covering seven million shares with a strike price of $14.57 a share; and the $1.7 million for home security. I estimated this option to have a present value at grant of $41.4 million, notwithstanding that the Redwood City, California-based company said the option was worth $50.1 million. Ellison’s $52.5 million pay package is 2.3 times the $22.7 million total pay package of Samuel Palmisano, the CEO of Armonk, New York-based International Business Machines Corp. IBM’s net sales of $91 billion in 2006 were 5.1 times larger than Oracle’s net sales of $18 billion. Ellison’s compensation was also 8.5 times the $6.2 million total pay of Paul Otellini, CEO of Santa Clara, California-based Intel Corp. Intel had double the net sales of Oracle. And then there is Ellison’s fellow billionaire, Steven Ballmer, the CEO of Microsoft Corp. He received total pay of just $1.3 million, while his Redmond, Washington-based company had net sales of $51 billion, 2.8 times Oracle’s. Putting aside the size of those sales, did Ellison’s performance justify his 2007 pay? In that fiscal year, Oracle generated a total return of 36%, a substantially better outcome than the 23% return on the Standard & Poor’s 500 Index. So, high performance equals high pay. Case closed. Not so fast. Oracle did well for its shareholders in its fiscal 2007, but Oracle’s stock price of $21.65 as of this 28 September wasn’t even half its all-time high closing price of $46.31 on 1 September 2000. Ellison has been Oracle’s CEO since he co-founded the company in 1977, so he’s responsible for each year’s result, good or bad, since then. And Oracle comes up short even when taking into consideration that most computer and software companies took huge stock hits in the 2000 crash. Measuring from 1 September, 2000, the day Oracle hit its high, to the close of its 2007 fiscal year, Oracle’s total return of negative 58% ranked it 11th (one is the top rank and 15 is the lowest). To be fair, Oracle has performed better in more narrow time windows. I checked its total return in six, five, four, three, two and one fiscal-year time windows, with each of them ended on 31 May 2007. Oracle’s respective ranking versus those 14 companies was eight, four, nine, five, four and four. Clearly, Oracle, at least in the last few years, has been performing better than the average company in this peer group. Executive pay packages are supposed to motivate performance. Ellison was granted options covering six million shares in fiscal 2005, seven million shares in fiscal 2007 and an additional seven million shares this past 5 July. That’s 20 million shares in three years. Will all of that act as a motivator when he already owns 1.2 billion shares? The members of the Oracle board compensation committee include: Jeffrey Berg, committee chairman, CEO, International Creative Management Inc.; Hector Garcia-Molina, professor of computer science and electrical engineering, Stanford University; and Naomi Seligman, senior partner, Ostriker von Simson, a technology research firm.